MVAP Medical Supplies > Sleep Products > Sunlight Jr. The Sunlight Jr is just that, a smaller version of the sun for your table top or desk. 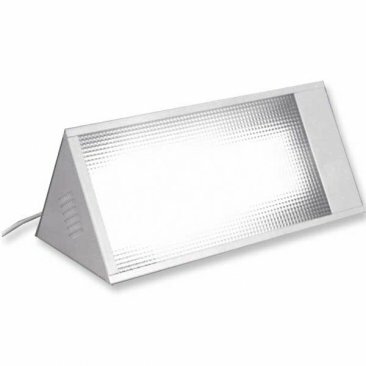 Made in the USA, it comes with a lifetime warranty on the light box and a two year guarantee on bulb. Energy efficient, it uses only 55 watts to run it's full spectrum 5000k, 10,000 Lux bulbs. Spectrally transparent prismatic diffuser that blocks UV, does not filter the quality of light and will not yellow. No heat and no bulb flutter with advanced electronics. Advanced energy efficient electronics that do not overload the lamps. UL Approved. Extremely small and portable, you can also order the optional carrying case!